Originally posted: November 1, 2017 . Last modified: January 7, 2019 . 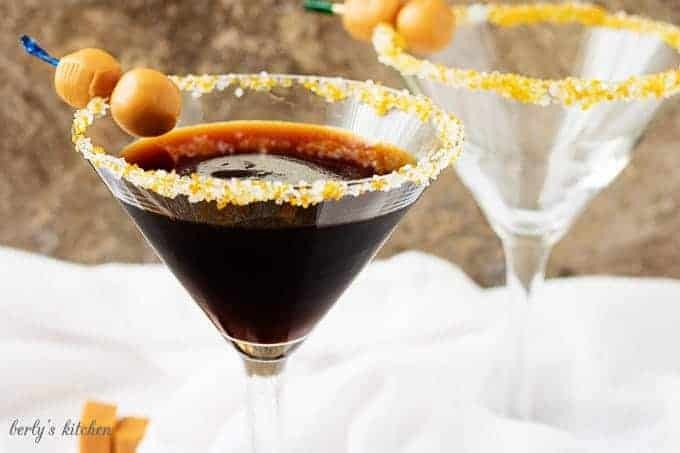 A Salted Caramel Coffee Martini is made with smooth gin, coffee liqueur, and sweet salted caramel syrup. It’s simple to make and even easier to drink. Have you ever tried a martini? Most of the time when I think of martinis I think of dry, after dinner drinks with an olive or two in the bottom of the glass. Today, John and I were working on an upcoming recipe, and he mentioned making a drink out of some ingredients that we already had in the kitchen. At first, what he was explaining didn’t make complete sense, but I decided to go with it. Here’s a little known fact about John. A few years ago he went to bartending school, and he can put together some pretty tasty drinks. 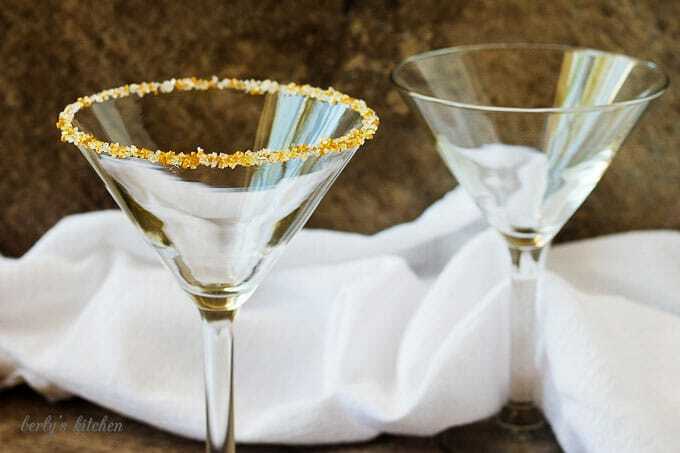 Have you seen his Chambord Citrus Tonic, Champagne Grenadine Spritzer, or my new favorite, his Pecan Pie Martini? 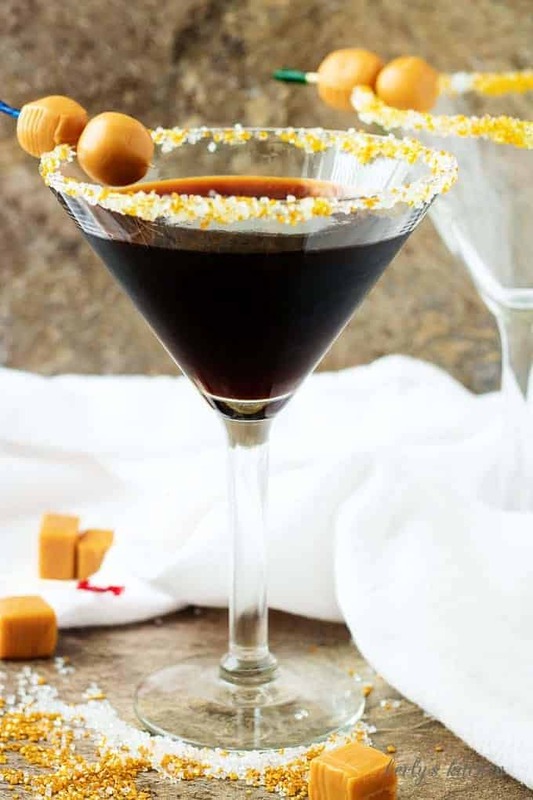 Now, back to this Salted Caramel Coffee Martini. When John first mentioned using gin, I was worried. It’s super dry, and I’m normally not a fan of drinks made with gin. However, the gin was so smooth and paired really well with the caramel syrup and coffee liqueur. It made an amazing cocktail. 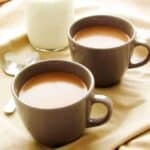 If you want a coffee drink, but don’t care for gin, then take a look at our hazelnut coffee. Not only is this martini tasty, but it is so simple to make. The sugar on the rim of the glass was something I added to make it pretty. 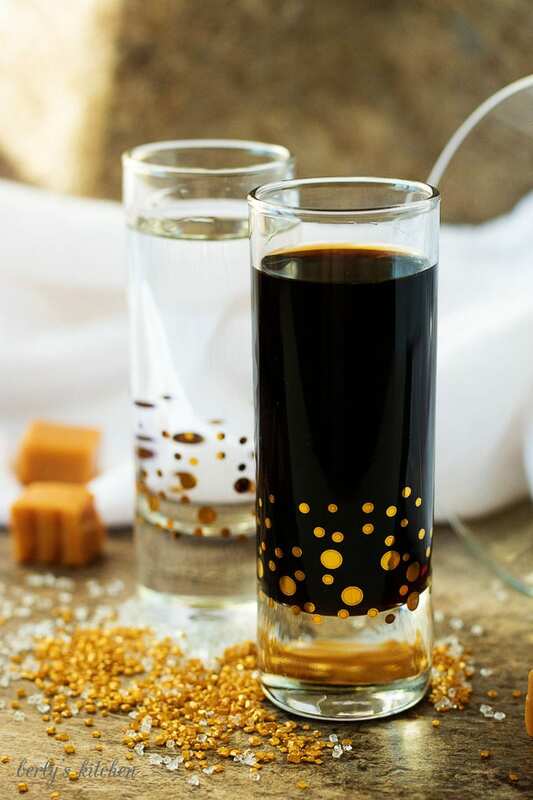 If you’d like to do the same, simply dip the rim of the glass into a little of the caramel syrup and shake off any excess. Carefully set the rim into a plate of gold and white decorating sugar. 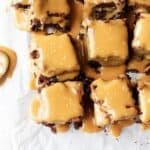 The little “caramel olives” are just as easy. We used caramel squares and shaped them into ovals then stuck them onto toothpicks. The drink itself comes together by pouring the gin, liqueur, and caramel syrup into a shaker over ice. Shake well to mix and pour into the martini glass. For this post, we only made enough for one large martini. If you’d like another glass, simply double the recipe. As always with all alcoholic drinks/posts, the recipe is intended for persons over the age of 21. Please drink responsibly. 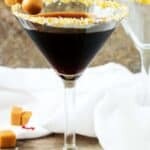 A Salted Caramel Coffee Martini is made with smooth gin, coffee liqueur, and sweet salted caramel syrup. It's simple to make and even easier to drink. Place ingredients in a drink shaker over ice. Shake to mix. Pour in a martini glass. Garnish with colored sugar or caramels if desired. *The calculated calories DO NOT include garnishes. Additionally, the calories are calculated for two small martinis or one large martini. That sounds delicious! I’ve had dirty martinis and love them. I’m going to have to try this! Thanks! This one is so good and really smooth. If you get a chance to give it a try, we’d love to know what you think. Have a great day!